In West Wars you get to explore the wild west and develop a character. You can do missions for experience such as mucking out the stables, scaring crows away, herding cattle, and harvesting grain. Some jobs will require you to buy items to complete the task. You can continue to do tasks until you master a task at one hundred percent. You can still do the task again but you won’t gain any experience just some cash at the expense of some energy loss. As you level up you can enter the town area and do even more jobs such as polish shoes. Some jobs will have a chance of giving you a random item you can use in the game. For example you might get a shirt that helps you duel better or a new pair of boots. 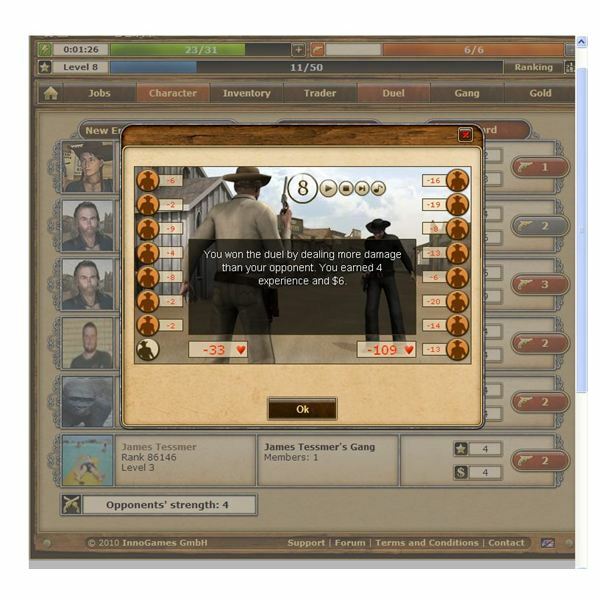 Jobs are the main part of this game as is dueling against either NPCs or regular Facebook players. A big part of West Wars is the duel which can be accessed through the duel screen. You need duel energy to complete duels but it can be added to your character points as you level up. Each duel with have a specific level so its best to pick duel near your level or below you for a greater change of winning. Higher level duels will also use up more of your duel points. Duels will happen automatically once you pick someone to fight. It would be nice if you could control the duel but you can’t at least at the lower levels. It’s unclear if this is possible at the higher duel levels or not. You will receive some cash from the duel if you happen to win it as well as experience points towards your next level in the game. At the trader you can trade in any excess inventory you have that you don’t want as well as buy new gear for your character which you can equip via the character screen. Gear can include weapons. Boots, shirts, scarves, pants and other items. Each inventory item will boost certain stats so you can mix and match your clothing and weapons to find the best combinations for your character. You may also accumulate other items that you can sell back to the trader if you don’t want them. From the character screen you can add energy which lets you complete more missions or add duel energy so you can complete more duels. Other skills include dexterity, strength, and intelligence. You can also write a small profile for your character here and at level fifteen choose a character class such as the adventurer, duelist, or soldier. Each class has its own distinct advantages so for example, the soldier gets ten percent more experience and does 10% more damage while the duelist gets duel energy faster. 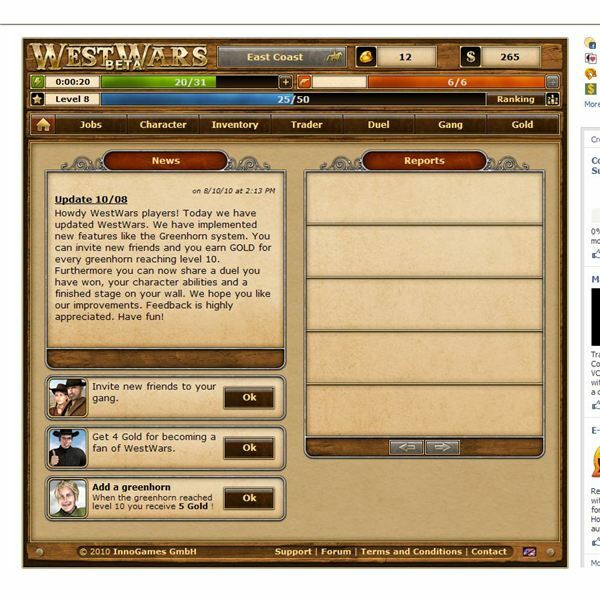 West Wars is a good Facebook RPG but it is not a great one. The game is still in a beta phase so we may see more content added to it soon. There are planety of jobs to do but nothing in the game really stands out at you. Graphically it looks nice and there are a few gunshots during te duel phase but that’s about is sound wise. If you like the wild west West wars may keep you entertained but the game isn’t a standout at least not yet.